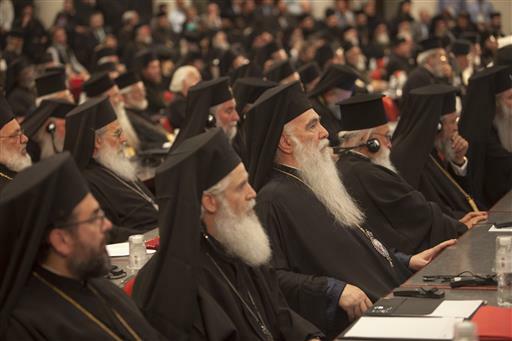 Council meets despite absence of four patriarchates under the sway of Russia. During the week of June 19, the leaders of the self-governing Orthodox churches worldwide gathered in council on the island of Crete. As the first global Council of the Orthodox Church in more than 1,000 years, this historic event promised to usher in a new era of conciliarity. I had a rare privilege of serving as an external correspondent for the Press Office of the Patriarchate of Constantinople, under the leadership of the Rev. John Chryssavgis. Together with other members of our team, I lived through the dramatic events leading up to the council, was present at some of the council’s sessions and served as a liaison between the council and the outside world, especially the journalists, scholars and ecumenical observers. This first of two articles describes attempts to subvert the council and how the attempts failed. The second article will deal with the outcome of the council and its importance for Catholics and other Christians. Preparations for this highly anticipated council began in 1961 and continued, with various setbacks and delays, for more than a half-century. Lacking the central organization of Roman Catholicism, Eastern Orthodoxy is a communion of the 14 recognized self-governing local churches, with the patriarch of Constantinople enjoying the position of first among equals. Patriarch Bartholomew and his predecessors in the Ecumenical Patriarchate of Constantinople have been the main supporters of the conciliar process on the global level. Historically, there have been tensions and power struggles between the “Hellenic” sphere of the Ecumenical Patriarchate and the “Slavic” sphere, which is dominated by the Russian Orthodox Church (Moscow Patriarchate). These tensions have to do with different political orientations and historical experiences: The Patriarchate of Constantinople continues to operate in a survival mode since the conquest of Constantinople by the Ottomans in 1453, having suffered the loss of most of its canonical territories over the past two centuries, while the Patriarchate of Moscow, scarred by the Soviet totalitarian regime, appears to be repeating history by aligning itself with the propaganda machine of Vladimir Putin’s authoritarian state. Constantinople sees the council as the means of consolidating its authority; Moscow fears that its status as the largest Orthodox church numerically may be diminished by the conciliar process. These longstanding tensions came to the surface when, less than two weeks before the start of the council, four churches—the patriarchates of Bulgaria, Georgia, Antioch and Russia—one after another announced that they would not be attending the event after all. While each church gave different reasons for non-attendance, the long hand of Moscow was discernible behind each decision. The first to pull out was the Bulgarian Orthodox Church, whose leaders cited various factors ranging from the trivial—the seating arrangements and the costs of the council, matters on which the church was promptly accommodated—to more serious concerns, such as its theological objections to specific documents, which were drafted for eventual ratification by the council. The theological concerns should have motivated the leadership of the Bulgarian Orthodox Church to come to the council in order to influence the outcome of the conciliar decisions, instead of demanding to postpone the event. According to reliable reports, the Bulgarian Patriarchate’s decision to pull out of the council was not independent: Some leaders of this church were in contact with their Russian counterparts shortly before the Bulgarian Orthodox Church’s council of bishops (the Holy Synod) issued its ultimatum about non-attendance. The Georgian Orthodox Church is subject to Moscow’s pressure in an equally direct manner and often served as the Russian Orthodox Church’s echo chamber at the pre-conciliar meetings and discussions. Along with the Bulgarian Orthodox Church, the Georgian church is one of the most inward-looking, with an especially vocal opposition to the ecumenical movement. The case of the Patriarchate of Antioch is more complex. In 2014, this church broke off eucharistic communion with the Patriarchate of Jerusalem over a jurisdictional dispute in Qatar. The oil-rich Muslim kingdom of Qatar has a walled compound that houses Christian houses of worship, including a single Eastern Orthodox parish of about 200 members. The congregation, almost all migrant temporary workers, is presently served by a clergyman from Jerusalem. While this man was a priest-monk, Antioch was quiet; when the Patriarchate of Jerusalem made him a bishop in 2013 and established a diocese of Qatar, Antioch objected that the land was its territory. While this quarrel about status symbols may seem quixotic and pedestrian, the underlying geopolitical factors merit some attention. Qatar is an ally of the United States in the war against the regime of Bashar al-Assad in Syria. The Qatari government is interested in building a natural gas pipeline, which would provide a serious challenge to Russia’s dominance in the European market. The Patriarchate of Antioch backs President Assad, who has been its protector against Islamic fundamentalists. This means that Qatar has good reasons for favoring a parish in the jurisdiction of the Patriarchate of Jerusalem rather than Antioch on its territory. Another significant player, whose interests align with those of President Assad and the Patriarchate of Antioch, is President Putin’s government—and its ideological extension, the Russian Orthodox Church. After Bulgaria pulled out of the council, Antioch followed, knowing that Russia supports its actions. But when was the tipping point for the Russian Orthodox Church? The most pessimistic view is that the Moscow Patriarchate planned to sabotage the council all along and was only looking for a suitable pretext. This would explain why official representatives of the Moscow Patriarchate insisted on inserting the clause “unless something unforeseen happens” into the agreement to convene the council, signed in 2014. Such a view is not implausible, given Patriarch Kirill’s tendency to subordinate church decisions to matters of political expedience and the advancement of the Russkiy Mir (“Russian world”), a pernicious ideology that provides a justification for Russian expansion, most especially in Ukraine. A more cautious view is that in the last three months leading up to the council, Patriarch Kirill was somewhat conflicted on the matter, keeping his options open and making unexpected tactical moves, such as meeting Pope Francis semi-privately at the Havana airport in Cuba. This move involved a considerable risk, as it exposed Patriarch Kirill to attacks by opponents of ecumenism among Orthodox fundamentalists and sectarians. The Moscow Patriarchate could have channeled these attacks in order to subvert the conciliar process, but Patriarch Kirill and his supporters, to their credit, mostly diffused them. Until the last week of May, Russian mass media and the Moscow Patriarchate showed no public signs of intending to sabotage the council. When exactly did Patriarch Kirill and his advisors decide to pull the trigger? On May 30, the patriarch spent some private time on a yacht with President Putin, as they traveled to the Russian monastery on Mount Athos to celebrate a highly politicized “millennium of Russian monasticism” by displaying the symbols of the Russkiy Mir: the “Christ-loving” autocrat and the obliging church bureaucrat upholding “traditional values” against the decaying West. While it is impossible to know what exactly transpired in the private exchange between President Putin and Patriarch Kirill, the matter of the impending council must have been mentioned. Was it this conversation that cemented the patriarch’s decision? We believe that there are no insurmountable difficulties to beginning the Council in June, despite the significant questions that have been raised regarding the drafts of the conciliar documents and conciliar proceedings. We acknowledge the legitimacy of some questions, such as the request to reopen the discussion of the drafts of the conciliar documents. We also concur that there are many other issues dealing with the Church in the twenty-first century that would require future Pan-Orthodox attention. Within two days, more than 1,000 Orthodox scholars around the world—among them highly influential authorities and deans of major Orthodox seminaries—signed the petition. The signed text of the petition was sent in an open letter to the heads of the 14 self-governing Orthodox churches on Sunday, June 12. Contrary to Moscow’s expectations, the Serbian Orthodox Church, which has both pro-Russian and pro-Greek elements within its episcopate, decided to send its delegation to the council. From private conversations with its leaders, I know that the scholars’ petition was taken into account as the Serbian church leaders were making a decision regarding their participation. Despite Moscow’s behind-the-scenes efforts to subvert the council, the Ecumenical Patriarch found the courage to go ahead with the event. As he landed on Crete, Patriarch Bartholomew’s first words were: “In January, the churches have agreed to hold the council. I am not the pope: I cannot go against the agreement of the primates.” The Orthodox Church has proven that it does not need a papal figure to convoke a general council. But the Ecumenical Patriarch’s primacy, when exercised in the service of conciliarity rather than self-aggrandizement, does keep the rest of the primates from obstructing the conciliar process. The delegations of the 10 self-governing Orthodox churches that arrived on Crete began the council in the spirit of brotherly love, openness and sincerity. They lamented the absence of the four sister churches and sent out the standing invitations to come, even at the “eleventh hour.” The delegates emphasized that the absentees did not invalidate the decisions of the council, as long as those decisions did not violate the rules that were agreed upon at the preparatory meetings. After six days of conciliar discussions, the delegates introduced minor amendments into the six documents on mission, fasting, diaspora, marriage, church organization and ecumenism. The last subject proved to be the most controversial, as many different local churches had to synchronize their ecumenical watches, so to speak. Despite their disagreements, the council fathers found the wisdom to speak with one voice and to walk toward unity. The leaders of the absentee churches have failed their flocks: They had the opportunity to represent their faithful and to write a new chapter of history together. Whatever their reaction to the conciliar documents, one thing remains clear: The era of global conciliarity has begun in the Orthodox Church, making it much harder for the local churches to remain in splendid isolation. Paul L. Gavrilyuk was the external correspondent of the ecumenical patriarchate’s press office at the Holy and Great Council of the Orthodox Church. He holds the Aquinas Chair in Theology and Philosophy in the Theology Department of the University of St. Thomas in St. Paul, Minn.